Today’s book trailer might be the scariest one I’ve ever seen — and that’s no surprise, considering that it’s for Broken Monsters, the new book by Lauren Beukes, author of time-traveling serial-killer thriller The Shining Girls. The trailer opens with a series of fleeting images: a sleeping parent and child, a battered old car idling on a street at night, a hand pointing in the shape of a gun. Next, as grainy, slightly dystopian surveillance video plays, a creepy older man whispers about taking a boy and altering him to make him more “beautiful” — a grotesque, disorienting shot of a child’s body with a teddy bear’s head nailed on hints at the horrifying alterations being made. But after all his improvements, the boy “won’t get up” and “the door won’t open.” Is he referring to the office door, briefly seen, of Detective Gabriella Versado? Or the mysterious red door, impossibly hanging in midair in a darkened alley, that we see next? Following the smash success of The Shining Girls, the publishers evidently decided to pull out all the stops with a slick, cinematic trailer that wouldn’t be out of place in a movie theater. Dark, evocative visuals and downright creepy voice-over give us everything we need to know that we want to read this gory thriller — although it takes a couple of viewings to put together the kaleidoscope of disturbing images while simultaneously listening to what the voice is telling you. Sadly, although the trailer page says “Out Now,” that must refer to Beukes’ own country of South Africa, because it won’t go on sale in the U.S. until September 16. 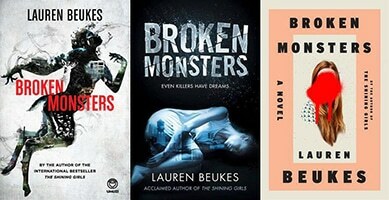 Check out the different cover art for its various editions; the South African version, with an anguished-looking writhing faun, tells you much more about the book than the relatively bland U.S. version (clearly designed to echo the Shining Girls cover art).Fans of The Shining Girls should be more than pleased with this frightening follow-up.